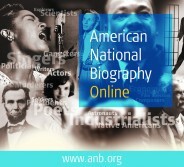 Discover stories from across the broad spectrum of the American experience in the celebrated ANB Online, a digitally integrative compendium of over 19,000 biographies encompassing the pioneers, influencers, and unsung heroes who have shaped history and culture. Missionaries and US Marines? It did not seem a natural combination. But while working on a book about American Protestant missionaries and their children I came across a missionary son who became a prominent officer in the USMC and one of the most effective agents of the Office of Strategic Services during World War II. Col. William Eddy was in charge of the OSS operations in North Africa, where he led a life filled with Nazis and spies and Vichy officials that seemed to flow directly out of Rick’s Café in Casablanca, the classic Humphrey Bogart film of that era. When Susan Ware heard me telling friends about this part of my research, she invited me to write the American National Biography (ANB) article on Eddy. I was delighted to do so. Eddy was born and raised in Lebanon as the son of Presbyterian missionaries, and acquired a fluency in the Arabic language that was all too rare in the United States when it entered World War II. A major theme I was developing for my book was the importance that missionaries and their children achieved in many domains of American life during the era of World War II, when the world beyond the North Atlantic West suddenly mattered. Missionary-connected individuals were among the few Americans who knew the languages and cultures of Japan, China, the Middle East and other areas relevant to the war effort and to the greater global involvement of private as well as governmental agencies in the 1940s and after. Eddy’s name first came to my attention when trolling for missionary connections in the Foreign Service and in the intelligence agencies. There, I read of a Marine officer who translated a conversation President Franklin D. Roosevelt had with the King of Saudi Arabia in February of 1945. He was the only person around who could speak both English and Arabic. 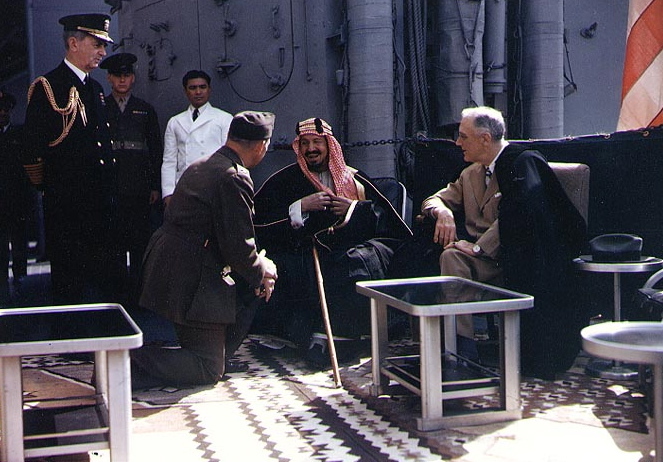 FDR Meets with King Ibn Saud, of Saudi Arabia, on board USS Quincy in the Great Bitter Lake, Egypt, on 14 February 1945. The King is speaking to the interpreter, Colonel William A. Eddy, USMC. Public domain via Wikimedia Commons. Eddy’s Arabic and his feel for Middle Eastern life were so good that he could recite long passages from the Quran in three dialects. “Wild Bill” Donovan, the Army General in charge of the OSS, grabbed Eddy as soon as he learned that the Marines had an officer supremely qualified for covert operations in the Arabic speaking, Islam-intense territories of North Africa. Once there Eddy, who was also fluent in French and German, consorted by day with Vichy officials and Wehrmacht officers and, by night, worked in secret with communist refugees from Franco’s Spain, eager to help topple the Axis. It was Eddy who personally briefed General George Patton prior to the American landings in North Africa in 1942. Later, Eddy was sent to Saudi Arabia as the American envoy there, and charmed King Ibn Saud with his idiomatic Arabic and his deep knowledge of the history and cultures of the Arab world. After the war Eddy was called back to Washington and was among the designers of the Central Intelligence Agency, and among that Agency’s first officers to advise President Truman on Middle Eastern affairs. Annoyed at what he saw as the short shrift Truman gave to the Arab peoples while recognizing the state of Israel, Eddy resigned from government service and spent the rest of his life as oil industry executive. Many missionaries leaned toward pacifism in their outlook on world politics, but quite a few missionary sons served in uniform, especially as intelligence officers. Eddy was right at home as a Marine in both world wars. Indeed, it was in the context of his service in World War I (he was decorated for valor in combat at Belleau Wood) that he was eager to re-enlist in 1941 after a two-decade career as a professor of English at Dartmouth and other colleges. Yet Eddy had his own version of the Protestant conscience. In autobiographical writings shortly before his death he remarked that men like himself — perhaps all CIA agents, he said — should “go to hell” for their deceits and double-dealings. Eddy felt especially guilty about the anti-Franco communists who were allowed to believe that the United States would facilitate the deposing of Franco’s version of fascism once the Axis was defeated. He knew that no such thing was going to happen. Always devout religiously, Eddy in his final fragments said of his betrayal of the brave Spaniards that he reminded himself of Peter, denying Christ in Mark 14:71: “I know not this man of whom ye speak.” When he died in 1962 Eddy was buried, in keeping with his instructions, in an Arab Christian cemetery in Lebanon where the only other American graves were of his missionary parents whom he revered and saw as his own models for serving the peoples of the world beyond American shores. David A. Hollinger is the author of six books, the most recent of which is After Cloven Tongues Of Fire: Protestant Liberalism In Modern American History (Princeton, 2013). He is also the co-editor, with Charles Capper, of the Oxford University Press's American Intellectual Tradition, the 7th edition of which will be published in January. He is a former President of the Organization of American Historians, and is Preston Hotchkis Professor of History Emeritus at the University of California, Berkeley. David A. Hollinger is author of the American National Biography article on William Eddy. Arabian Knight by Thomas W Lippman is a great biography of Eddy. Without going into the details, and with all due respect, this sentence manifests a clear lack of knowledge of both the Quran and the Arabic language. There are, indeed, variant “readings” of the Quran, but it is inaccurate and misleading to imply that the Quran can be recited in one of the spoken Arabic dialects – let alone three. It is a contention, no matter how broadly construed, that makes no linguistic sense whatsoever.